The BAT	global variable sets the minimum battery voltage required for Tx operation. The buzzer and the LED will play the Battery alarm code if voltage gets lower. The value of BAT is set in ADC units in the [0, 1023] range; it is actually an index relative to 50% of the actual battery voltage on a 5 volts scale. If the transmitter is powered by a 2S LiPo then 7 volts corresponds also to a 80% discharge, which is also the maximum recommended discharge. You may choose to increase the value of BAT to be warned before the minimal voltage is reached: add 21 per 100mV, eg: BAT = 716+21 = 737 for 7.1 volts. This is why the default value for BAT is 740. 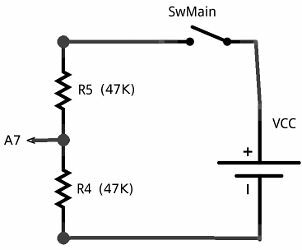 The precision of the voltage measurement is affected by the tolerance of the resistors and you may have to calibrate it with a multimeter. Notice that with R4 = R5 you should not use a battery > 10 volts because the analog input cannot handle more than 5 volts.